Fibres, yarns and threads are exposed to many different and often changing mechanical and thermal strains. 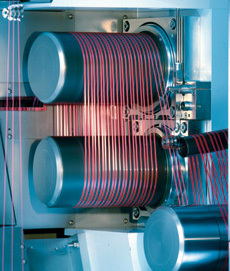 Friction is found throughout the process chain, from extrusion of the polymer melt to winding up of the twisted thread. Spin finishes and lubricants are therefore an elementary prerequisite for an economic production and further processing of synthetic and natural fibres. Our fibre auxiliaries or spin finishes control the friction and the electrostatic charge. They serve as efficient process aids on the interface of fibre/material and machine part. Our product range offers the best solution for your spinning processes. ​Not only high quality yarns result, but also a high throughput, only little waste, short downtimes as well as clean machines and spinning halls.